Seven Card Stud is an older poker game that is one of the first games most players learn. The game is very simple, and makes it easy for new players to start playing poker. Seven card stud deals each player three down cards and four up cards, so it is very important for players to read the board and pay attention to the dead cards. Read on to learn the full rules of the game, and some other interesting facts about 7 Card Stud. In Seven Card Stud players try to win money by either betting the other players out of the pot, or showing down the best hand at the end of the game. To be a profitable player, you should bet as much money as possible when you have a good hand, and save as much money as possible when you don't have the best hand. Read on to learn the full rules and some Seven Card Stud strategy tips. Also, unlike Texas Hold'em, the game forces each player to post an ante at the start of every hand - this replaces the "blinds" system used in most other games. Besides the ante, there is also a bring in bet which forces action immediately. We'll explain all that momentarily. Seven Card Stud tables are referred to by their betting stakes. For example, a $10/$20 game would have a small bet of $10 (used on third and fourth street) and a big bet of $20 (used on fifth street and beyond). In a game like this, the ante would typically be $1, and the bring-in bet would be $3. More on that momentarily. The game begins with each player posting their ante. This is a small bet that each player is forced to put into the pot before the hand even begins, and is there to create action. The ante is usually sized as 1/5th to 1/10th of the small bet. So, in a $5/$10 game you could expect an ante between $0.50 and $1. After the antes are posted, the dealer deals clockwise, one card at a time, starting with the player to his/her direct left. Each player receives one down card, another down card, and finally, one up card. After each player has received their cards, the player with the lowest up card acts first. He/she can either bet the bring-in (usually sized about 1/3 of the small bet at the table), or complete the bet (meaning they bet one small bet). If two players have the same lowest up card, the bring-in is decided by suit rankings (diamonds are best, then clubs, then hearts, then spades). As you can see, the player with the two of hearts had to complete the bring in because their up-card was lowest. In this case, the player chose to just make the bring-in ($3), and not complete the bet, which would have raised it to $10. After the bring in is completed, action continues clockwise around the table. There are a few options that each player will have, depending on the action before them. If the bring-in is the only bet, the player can either fold, call the bring-in, or complete the bet to one small bet. If the bet has already been completed, the player can either fold, call the bet, or raise to two small bets. If the bet has already been raised, the player can either fold, call the raise, or re-raise to three bets. Once every player has either folded or matched the highest bet, the hand moves on to fourth street. NOTE - if at any time during the hand everyone folds except one player, that player wins the pot and can either muck or show his/her hand. The dealer now deals each remaining player another face-up card, starting with the player to the dealers' left, and moving clockwise around the table. Now, the player with the best two up cards acts first. So, for example, if one player had Ace-King and another had Ten-Ten, the player with the tens would act first because a pair beats two high cards. If there happens to be a tie, like if two people had a pair of tens, the person who was dealt to first will act first. This player can either check or bet one small bet. If that player checks, the rest of the players can either check behind, or make one small bet. If a bet is made, the rest of players can either fold, call the bet, or raise to two small bets. If a raise has been made, players can either fold, call the raise, or raise to three small bets. Betting is always capped at four total bets. As always, action moves clockwise around the table. Fifth Street is exactly the same as fourth street, with one major exception. Each remaining player receives another up card, dealt out clockwise starting with the player directly to the left of the dealer. Action begins with the player who has the best hand showing (each player now has three up-cards, so the best possible hand that could be showing is AAA). This player can either check or bet, and after they act play continues clockwise around the table. This is where the one exception comes into play. During fifth street and beyond, the bets are now all big bets, so if this was a $5/$10 game, the bet would now be $10 instead of $5 like we were using before. Sixth street is exactly the same as fifth street. Each remaining player receives another up-card, and action starts with the player with the best hand showing, and continues clockwise around the table until everyone has either folded or matched the highest bet. Once again, big bets are used instead of small bets. For seventh street, each remaining player receives another card, but this time it is face-down. This gives each player three total down-cards and four total up-cards. The player with the best hand showing acts first, and play continues clockwise around the table until every player has either folded or matched the highest bet. If two or more players match the highest bet, we have a showdown. NOTE - If the dealer runs out of cards on Seventh Street, he/she can announce a "community card". The community card is a single card dealt into the middle of the table, and it can be used by any player at the table to complete their hand. 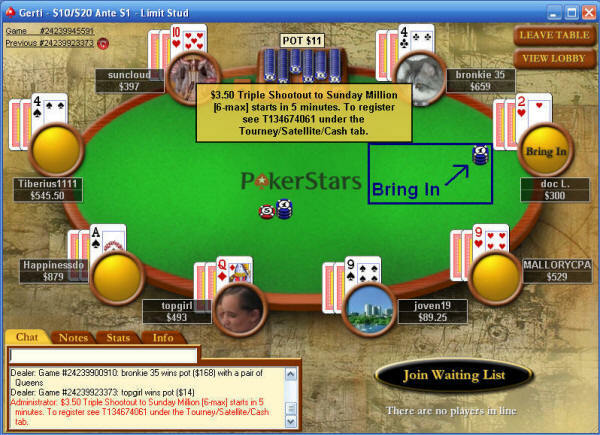 Most poker sites do offer 7 Card Stud games, but a few of the sites stand out from the rest. Luckily for you, we've tested and ranked the best poker rooms with Seven Card Stud, so you can find the best possible place to play your favorite game. The history and origin of poker and seven card stud poker is not quite clear. Many believe that the word poker came from the French game Poque, this word is believed to be from the German word Pochen (to knock). Yet this game closely resembles a Persian game named Nas, and this game is played with a five suit deck. Bluffing is said to come from yet another source, a New England game called brag which is just like poker except that it is played with only three cards. In New Orleans, 1829 the first recorded poker game in the United States was played with a 20 card deck. Each card was valued 10 and higher. This game was not named but the point was to bet on whom had the highest hand. Mississippi river boats soon adopted and adapted this game; they used a 52 card variant to swindle travelers and take their money. The American Civil War brought out stud poker; cowboys are sometimes given the credit for this. The first version played, Five Card Stud, was described as an official poker variant. The first favored variation was draw poker. This remained the case until the 20th century when an anonymous person dreamed up Seven Card Stud. Until Texas Hold'em was introduced in the 1980's, Seven Card Stud was the favorite of all poker variations. Most poker games revolve around Seven Card Stud and its variations. When the Poker Hall of Fame was opened, some of the greatest poker players were inducted into it, including "Wild Bill" Hicock, shot and killed during a poker game holding the "dead mans hand". The dead man's hand is still referred to today when a player has aces of eights. "Red" Hodges who is said to be the best Seven Card Stud player there ever was also in the Poker Hall of Fame. There are a few different variations of Seven Stud, although the betting is almost always fixed limit. Other than Seven Card Stud, there is Seven Card Stud High Low, which is the same game except half of the pot goes to the player with the lowest hand. Learn the differences between Seven Card Stud and Seven Card Stud Hi-Lo. There is also Razz, which is Seven Card Stud, except the player with the lowest hand wins the pot.